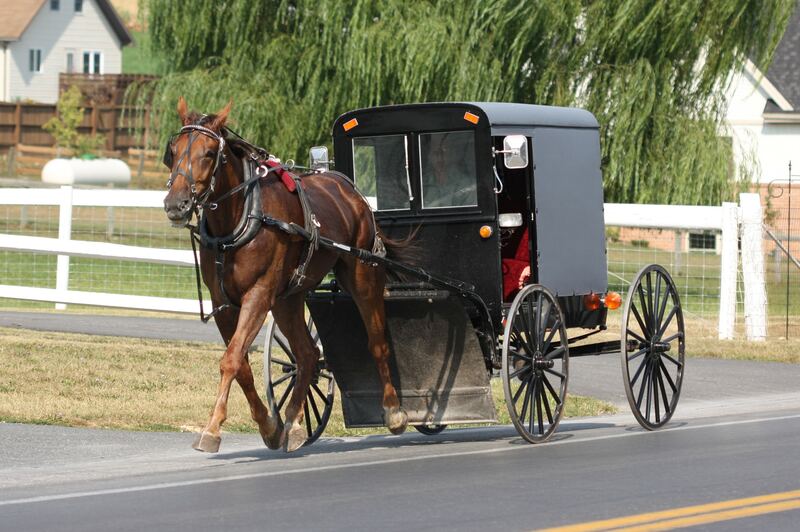 Amish buggy on State Route 340 in Pennsylvania Dutch country. What do apples, black bears and rhododendrons have in common? They are, respectively, West Virginia’s state fruit, state animal and state flower. There are state dogs, state insects, state dances and even state soils. Strangely, though, I’ve yet to hear of a state car. So maybe we can start the ball rolling. New York’s Yellow Cabs pretty much choose themselves. To me, pink Cadillacs immediately say Florida. California could have either a 1956 T-Bird or a Toyota Prius, and for Nevada (well, Vegas) I’d propose a Cadillac Escalade with spinner hubcaps. As for West Virginia – what would its state vehicle be? Well, while we wait at the lights in the city of Wheeling, all heads turn to watch an ancient truck as it coughs and wheezes its way down the outside lane. It’s a patchwork of rust and panels cannibalised from other trucks, and its precariously balanced load consists of farm implements, engine parts and furniture – all guarded by an equally scruffy-looking mutt. All that’s lacking is a crate of chickens. Every other car waiting at the lights would be perfectly acceptable for any New Hampshire soccer mom, but this truck is West Virginia on Wheels – the vehicular equivalent of spotting a bear in Yellowstone. If we see nothing else along the 16-mile section of U.S. Route 40, the Historic National Road that crosses the northern panhandle of West Virginia, we’ll still leave happy. As it is, the scenery east of Wheeling is simply wonderful, climbing gently up into the foothills of the Appalachians and over the state line, through rich green woodland, into Pennsylvania. Just past Uniontown is Jumonville Glen, where Lt. Col. George Washington – then a loyal British subject – inflicted a defeat on the French. This led to the Battle of Fort Necessity, a few miles farther on, where Washington’s surrender triggered a war that would ultimately see France lose all influence in North America. Having gained sole control over the colonies, Britain would go on to decide that a good way to fund its expanding empire would be to tax the hell out of its American subjects. And the rest, as they say, is history. Almost directly opposite the fort is the road north to Fallingwater, Frank Lloyd Wright’s architectural masterpiece, and the 20-mile round trip is worth it for the scenery alone. Winding its way through dense woodland, Pennsylvania Route 381 leads us into Ohiopyle State Park and past rafters and kayakers enjoying the white waters of the Youghiogheny River. Ohiopyle itself looks a great place, too, but whoever decided to market it as “The Laurel Highlands’ Best Kept Secret” was using more than a little poetic licence. It’s the kind of place where finding a parking space means taking part in a motorised version of musical chairs. We decide to pass and head on to Fallingwater. Even if your interest in architecture is limited, this house is still worth seeing: a building of hard, modernist shapes and edges that manages to blend in with the surrounding woodland and the waterfalls that give it its name. And for those of us who revel in tales of human fallibility, it’s nice to learn that while Wright may have been an architectural genius there were faults in the way the building was actually constructed and the trustees have been repairing it ever since. Back on U.S. Route 40, we cross from Pennsylvania into Maryland and continue eastward through the Allegheny Mountains. While this section of the National Road passes by a number of historic inns, the overriding sense I get as it makes its way from one forested peak to the next is just how remote this part of the country must have felt before the road was built. We find ourselves a hotel in Hagerstown too late to go out exploring, but the groups of youths standing on every street corner drinking beer and trying to look menacing do give it quite a European feel. And when half the staff at our hotel turn out to be Estonian, it really begins to feel like home – that is, until we try to order wine with dinner: “I’m sorry sir, we don’t serve alcohol in the restaurant. Maybe you’d like to eat in the bar?” Well, yes, maybe we would. Our first destination the next day is Gettysburg National Military Park, a 30-mile drive away. Famed as much for the two-minute address given by Lincoln at the dedication of its cemetery in November 1863 as it is for the three-day battle in July of the same year, it’s a must-see for Civil War buffs and casual visitors alike. Numbering ourselves among the latter, we start off at the newly opened visitor centre and get an introduction to the significance of Gettysburg through a moving, Morgan Freeman-narrated film “A New Birth of Freedom.” After speed-visiting the museum (we’ve woefully underestimated how long this place really warrants) we invest in an audio field guide and set off on a two-hour drive around the battlefield. Without a big-picture understanding of the various stages of the battle, it’s difficult to put every skirmish, attack and retreat into context, but it’s still a fascinating way to explore a place that saw such carnage. 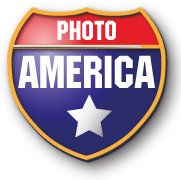 We head east out of Gettysburg on U.S. Highway 30 – better known as the Lincoln Highway, America’s first coast-to-coast road – as far as Lancaster before following State Route 340 into Pennsylvania Dutch country. It’s Sunday afternoon and the Amish are out visiting in their horse-drawn buggies, or playing mass games of netball – the boys in buttoned-up shirts, the girls in bonnets and full length skirts, despite the sweltering heat. I have to say, it’s a very odd feeling going somewhere simply to look at people who choose to dress differently. Do people visit Crown Heights, in Brooklyn, to stare at the Hasidic Jews? Maybe they do, but I for one feel that my presence is incredibly intrusive here. I know there’s an entire tourist industry built on looking at the Amish but to me it just feels rude. From here we head east on Interstate 276, then follow U.S. Route 1 through Trenton, N.J. – past the famous “Trenton Makes – The World Takes” sign, erected in 1911 to celebrate the city’s industrial output – and on to the university city of Princeton for a day-or-so’s rest and recuperation in the company of my sister Sarah and her family. There comes a time in any trip when it’s important to stop for a while, gather one’s thoughts and do nothing more challenging than catch up with the laundry. Sarah, though, has other plans. Eager to show us some of the attractions that persuaded her, husband Andy, and sons Harry and Alexander to up sticks from Milton Keynes (a town widely held to be England’s dullest) in 2007 for a new life in the land of opportunity, she piles us into her car with the promise of a picnic by the side of a river. And, as it turns out, this provides a really neat conclusion to this leg of our journey. Having already taken in Fort Necessity and Gettysburg, we complete our hat trick of “Sites of Defining Moments from Wars on American Soil” with a lunch of potato chips and ham sandwiches by the side of the Delaware River, just where Gen. George Washington (no longer quite the loyal British subject he had been) made his famous crossing on Christmas Day 1776 and went on to score a morale-boosting win for the home team in the American Revolutionary War. This entry was posted in East USA Circuit.